There’s nothing quite like the crusty, buttery, ooey gooey goodness of a perfectly done grilled cheese. Whether it’s a classic cheddar & tomato soup combo, an attempt to recreate grandma’s favorite, or a “grown-up” version with all the fancy fixings — the comfort of a grilled cheese sandwich is undeniable. The perfect grilled cheese starts with bread. Liberally-buttered bread. Some may say the more butter, the better, but there is such a thing as over-buttering. To avoid a greasy sandwich, we suggest about ½ tablespoon per slice of bread. Start by softening the butter for an even spread. Then, slather on the outsides of the bread to achieve that perfectly crisp, golden brown crust. Next, we move on to the best part, the CHEESE! And that’s not just because we’re a cheese company. You want an evenly melted layer from the center all the way to the edges. You can easily achieve this by using GRATED cheese. Keep in mind, certain cheeses melt easier than others. 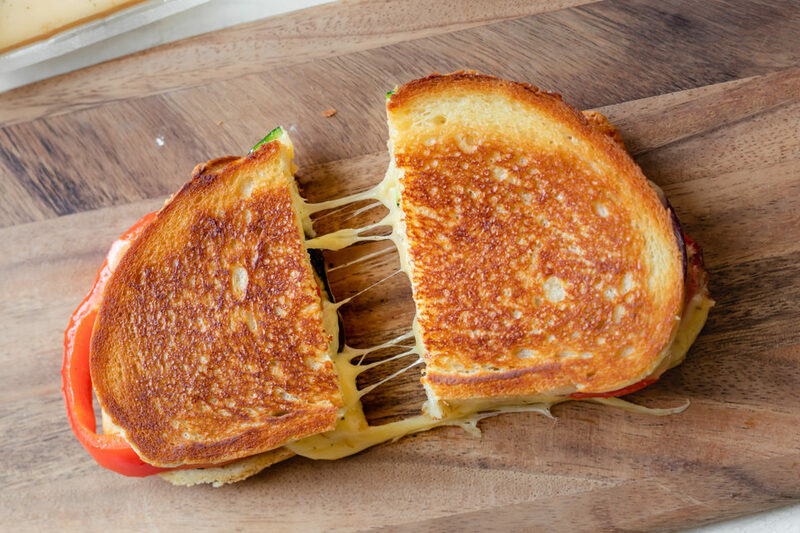 Mild, creamy cheeses like Havarti, Gouda and our Grand Cru® are prime candidates for melty perfection. Or, consider a flavored variety like Dill Havarti or 3 Chile Pepper Gouda for an extra flavor kick. So, we’ve got the essentials: bread, butter and cheese. We’re ready for some grilled cheese action! When it comes to cooking, we want enough heat to toast the bread without burning it while fully melting the cheese all the way to the center. A skillet pre-heated to medium or medium-low is optimal (adjust yours accordingly). Start by placing one slice of buttered bread face down in the pan, topping with grated cheese. Add the second slice buttered side up. Cook 2-4 minutes per side until bread is golden brown and cheese is melted. If you feel like upping the ante, add your favorite meats, veggies or spreads. Give our “Grilled Cheese Four Ways” post a read for some creatively delicious suggestions. Remember, the more fillings you add, the crustier the bread needs to be so it doesn’t get soggy. We suggest using lightly pre-toasted or day-old bread for heartier sandwiches. Finally, whether you prefer your sandwiches cut diagonally or vertically — that’s an argument for a different time. Slice up all that cheesy, buttery goodness and enjoy!